Virgin Australia is dropping Abu Dhabi from its route network as the airline concentrates its international long-haul flying on the United States and North Asia. The airline said in a statement on Monday it would no longer commence Perth-Abu Dhabi nonstop flights that were slated to begin in June with Airbus A330-200 equipment. The decision to not proceed with the new route, which was first announced in September, came on top of Virgin ending its three times weekly Boeing 777-300ER Sydney-Abu Dhabi flights in February. “Subsequent changes in market conditions have made the route no longer viable for Virgin Australia,” Virgin said. Cutting capacity to Abu Dhabi highlights Virgin’s increasing focus on North America, where the airline is returning to the Melbourne-Los Angeles route from April 4 after a two and a half year absence. Meanwhile, Virgin was seeking the green light from competition regulators to establish an alliance with HNA Group and Hong Kong Airlines to launch nonstop services to Hong Kong and mainland China later in 2017. 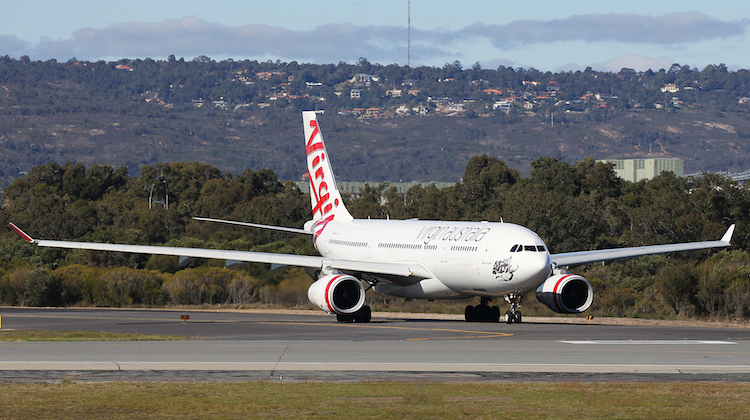 Cancellation of the proposed Perth-Abu Dhabi service suggests Virgin was likely to use the Airbus A330-200 that would have been deployed on the route for its venture to North Asia. Virgin’s international flying posted underlying earnings before interest and tax (EBIT) of $800,000 for the six months to December 31 2016, an improvement from an underlying EBIT loss of $30.8 million in the prior corresponding period. The financial details included Virgin’s trans-Tasman (served as part of an alliance with Air New Zealand) and South Pacific network, as well as its flights to Bali from Brisbane, Port Hedland and Sydney, with the performance of its long-haul network not detailed separately. Abu Dhabi has been the most expendable part of Virgin’s international network, with the airline regularly suspending service to the United Arab Emirates (UAE) capital since the inaugural service took off in 2011 whenever its Boeing 777-300ERs had to be taken offline for scheduled maintenance or cabin upgrades. It also means Virgin will no longer serve the hub of its alliance partner and major shareholder Etihad Airways, continuing a trend of airlines cutting capacity to Abu Dhabi in recent times. A recent research note from aviation thinktank CAPA – Centre for Aviation cites two examples – Airberlin cancelled its Dusseldorf-Abu Dhabi service in March 2017, while Alitalia stopped flying between Venice and the UAE capital in October 2016. There have also been reduced services from Air Seychelles and Jet Airways. However, Virgin is the first airline that Etihad holds equity in that will exit Abu Dhabi completely. Etihad Regional, a regional carrier baed in Switzerland flying across Western Europe, never served Abu Dhabi. CAPA suggested partner airlines faced difficulties in securing seats beyond Abu Dhabi on Etihad flights. Further, there was no much demand for Abu Dhabi as a destination. “As understood by CAPA, the problem partner airlines have faced in Abu Dhabi is that because it is a hub with minimal local demand, onward connections on Etihad are key to ensuring the success of Abu Dhabi services,” CAPA said in the research note dated January 30. Virgin seems to be run by a few ‘wise men’ who make decisions on a day-to-day basis with limited analytical and factual support. As reported they have made a lot of staff redundant this year to boost profit next year, their lounges are starting to look aged, the schedule is continuously being reduced, Last year they cut some of their premium services like Premium entry in Brisbane and handed over my corporate business to Qantas (they now have premium entry). They are the only domestic airline to not have self service yet Is it all starting to look a bit arrogant? This airline appears to be flying around like a chook with its head chopped off. Just hope it stays the course to provide competition to Qantas. Hope the USA plan works. Appears management is a liability. The recent announcement for International lounges arrangements are confusing, especially out of LAX. Something is not right at VA…. I am all in favour of competition in the airline industry but I feel that the messages coming from the Virgin Camp is confused and lacks clarity of direction. For example, the choice of departure point in Australia for the Hong Kong route. All three are already serviced by carriers, there is no competitive advantage in keeping it secret given the capacity already on the route. Many people talk about servicing places like Newcastle with additional services. The other night I saw an ATR overnighting in Newcastle instead of an E190 or B737. Are passenger loads that low that the ATR is being used instead of the jets? Given the load factors on Jetstar, maybe Tigerair should take over VA flights out of Newcastle. Further, I booked a flight from Sydney to Cairns two weeks ago. Qantas were $189 versus VA $302. Granted the Qantas flight was a codeshare with Jetstar but the Qantas fare included baggage and a food voucher. But speaking to other tourists in Cairns who flew VA form Syd to Cns, they said that the plane was almost empty (a B737). When you start joining the dots, it tells me there are serious problems at VA. I hope the new managerial import can turn the airline around and offer real competition. More proof that this airline is being barely kept alive by massive cash injections by foreign airlines. It highlights just how remarkable Qantas’ turnaround has been and I for one am proud to support an Australian business that has fought its way back. Service and product is vastly superior to VA too. Virgin’a staff must be feeling very worried and they should as people vote with their feet. Competing directly with QANTAS has turned them from Virgin Blue to QANTAS Mark 2. It’s a shame that Virgin are not going to carry out the Abu Dhabi route from Perth. Perth is so well located for so many other services than just Asia, it’s a pity Australia’s airlines can’t make it more useful. I think their biggest problem is that they (the Australian carriers) lack enough aircraft to provide frequency nationwide, so it leaves the gap wide open for all other competing carriers – particularly the Asian and Gulf carriers. With the competitors products (and above all) frequency being superior to Australia, we just can’t compete! Unfortunately for every service that VA or QF start, they have to often do so at the expense of another route – apart from sometimes being able to meet extra holiday or seasonal demand at times. Theories aside, I know I avoid flying through UAE airports when traveling to Europe. A couple of bad experiences (particularly at Abu Dhabi) mean my wife and I always travel with airlines that stage via non-middle eastern hubs where possible. Come to think of it – our worst experience was on a Etihad/VA code-share flight. Never again. Each to their own, but if we get the option of Singapore / Hong Kong with half way reasonable times we will take it. This really is almost laughable if it weren’t so serious. The general media (not referring to AA) were all over the CEO of this outfit like a rash a few years ago. Qantas was being painted as a dinosaur and VA as the future. I always suspected the latter lacked substance, experience and suffered from an insular culture in which everyone thinks they are just the bee’s knees but never looks outside the window. Let’s recap shall we, here we are now, in 2017 Qantas’ costs are lower than VA, Qantas is sustainable profit-wise in all segments including International, while not as large as it once was (people forget nearly every Euro airline pulled out of this part of the world too), Qantas’ network is vastly bigger and growing with the introduction of the 787 (such aircraft are only a pipe dream for VA) and despite what others say, on balance has a much better product… if people don’t agree with that then consider product is a complete package – I walk into a Qantas Terminal I can be checked in self-serve and auto-bagdrop within 3-5mins – electronic bag tags, etc. At VA even recently, the pathetic attempt to ‘match’ this covering up the fact they bought the wrong system is that I obtain a boarding pass and bag tags at a kiosk then join a bag drop line where I am asked for ID… why didn’t I just join a queue in the first place and let them check me in… what a pathetic joke. Qantas is in the process of moving ahead substantially with on board entertainment and I envisage in 5-10 years it is likely Qantas will have a mainline fleet of 737-800MAX, 787-9 and A380. Efficient, clean, profitable. You can fix product, it’s much harder to recover from woeful financial management. Qantas’ write-down and losses a few years ago were a blip, long term they are sustainable. At this point, long term, VA is a joke with what must be the worst management in the industry. It must be like being on a sinking ship, running to the bridge and finding the Captain is Daffy Duck. What could possibly go wrong there? Virgin needs to wake up and realise it’s a domestic airline…do that job well…get profitable…leverage alliances and build an international network (in addition to regional 737s to South Pacific) over time with something people in business call “a strategy” . That said they outsourced DPS service to Tiger and look what happened there.